Each time Pentagon strategist Dr. Fritz Kraemer spoke about the strained strategic relations between France and the US in NATO, he ended with the remark to French officers, "If our deterrence and defense strategies against the USSR go wrong, we will all hang next to each other." Times have changed however, and France is not only back in NATO, but also has evolved as an active and reliable partner in the Alliance, taking responsibility for global security, justice and human rights in places such as Libya first and now Mali. Following his dogma that radicals have to be met with thoroughgoing containment, and that diplomacy never works without the ability to resort to force, Fritz Kraemer would have very much appreciated the recent military engagements of France. Hence it was the right moment to discuss Dr. Kraemer's legacy, his aphorisms and his ideas together with distinguished French officers and strategists in Paris. The strategic salon by invitation of the World Security Network was chaired and moderated by its founder Dr. Hubertus Hoffmann, who could enjoy Fritz Kraemer's mentorship for 25 years and has recently published a biography about the legendary strategist and spiritual father of some of the most influential American statesman, including Henry Kissinger or Alexander Haig. Accordingly, the essence of the book "True Keeper of the Holy Flame - The Legacy of Pentagon Strategist and Mentor Dr Fritz Kraemer" found its way into the discussion (more on: www.worldsecuritynetwork.com/fritzkraemer). Nicole Junkermann (second from right) and LtCol ret Dr. Mario Ohle (right) hosted a Strategic Salon in Paris with World Security Network Founder Dr. Hubertus Hoffmann (left) to discuss “France and Germany and the EU in a World 3.0 - What we can learn from Pentagon Strategist Dr Fritz Kraemer for creating a better common Foreign and Security Policy” with French Admirals Pierre Lacoste (center) and Jean Dufourcq (second from left) and other members of the Paris strategic community. Following a welcome speech by hosts Nicole Junkermann and LtCol ret Dr. Mario Ohle, the discussion was opened with statements from French Admirals Pierre Lacoste and Jean Dufourcq on the topic "France and Germany and the EU in a World 3.0 - What we can learn from Pentagon Strategist Dr Fritz Kraemer for creating a better common Foreign and Seucrity Policy". The audience in the grand salon included Germany's Deputy Military Attaché LtCol Frank Fischer, members of the Young Presidents Organization and WPO like Pierre-Marcel Blanchot, First Secretary of the Dutch Embassy Daniel Stork, representatives of the Paris office of the German Marshal Fund, young editors of the World Security Network Foundation like Dr. Jeannette Princess zu Fürstenberg and members of the Youth Atlantic Treaty Association. Legendary Admiral ret. Pierre Lacoste inspired his audience with a tour d'horizon on the current state of European security policy, the transatlantic partnership and his personal impressions of Dr. Fritz Kraemer. He and Kraemer had the chance to exchange their thoughts during a meeting in Switzerland, and Admiral Lacoste was able to give an impression of Dr. Kraemer's intellectual world. Admiral Lacoste began his career in the French military during World War II, when he escaped from occupied France in 1943 and joined the French forces in North Africa. He served as Military Chief of Staff under Prime Minister Raymond Barre and later became head of the French external security and intelligence agency DGSE, where he served from 1982 to 1985. From 1986 to 1989 he chaired the Foundation for National Defense Studies, and became chairman of the National Liaison Committee "Defense – Army – Nation" for the Center for Civic Information in 1989. He stayed active in politics and security also after his retirement, being responsible for the structuring the professional field of economic intelligence in France and as president of the Federation of Competitive Intelligence Professionals. During his contribution, Admiral Lacoste remembered the strategic approach of US President Ronald Reagan, which was supported by Fritz Kraemer, and his dominant "Peace Through Strength" strategy. "Fritz Kraemer had real influence in Washington. Reagan achieved the decline of the USSR by putting the oil price under pressure, thus drying out one of the most important income sources for the Soviets. Secondly he increased the military competition and embroiled the USSR into an arms race through initiative such as SDI and by doubling the budget of the Pentagon. This was indeed a clever idea. The Soviets believed they had to compete with the US, and subsequently lost more than 20 percent of their GNP to armament. In the US, the military research and development meanwhile had a positive effect on the civilian side as well, something which could not bee seen in USSR. Because industries and markets in the USSR were closed and inflexible, the military modernization did not cause any positive effects in other areas and did not stimulate the civil development at all. Gorbatschov understood this dilemma, and when he met with Reagan in Reykjavik in 1986, they decided to set up measurements for building confidence, real arms reductions and to cool down the conflict of both super powers. Reagan's strategy pretty much reflected Kraemer's thoughts –talk to your opponents, but let them know that you can rely on strength and power." Talking about the conflict of Israel and Palestine, the admiral referred to a recent TV report, in which several leaders of Israel's domestic security agency Shin Bet commented on the assassination of Prime Minister Yitzhak Rabin in 1995. During the documentary, the intelligence officers revealed that they were shocked seeing Yitzhak Rabin being killed by 'one of them', and not by the Arab enemies that they were working against. Admiral Lacoste deemed this to be an important lesson about how to deal with extremist groups or individuals. "Even if they are terrorists", the Admiral said, "we must always consider to speak with them and to integrate them into the dialogue – force can only be the last option". This statement very much reflected the bottom line of the chapter World 3.0 in Hubertus Hoffmann's new book on Fritz Kraemer. Hoffmann here also promotes to search for a dialogue with aggressors in a fresh creative double strategy of power and reconciliation, hawk and dove, Uzi and olive branch. Following Admiral Lacoste's contribution, Admiral Jean Dufourcq lead the discussion towards a broader topic. As former Directeur d'Étude at the prestigious École Militaire in Paris and now Editor-in-Chief of the important French Revue Dèfense Nationale (www.defnat.com), Admiral Dufourcq is a renowned pundit on European security policy and an important strategist in France. He illustrated the importance of a closer European defence and security policy by claiming that the influence of the cultural tie between the USA and Europe on US security policy would be by far not as strong as many people claim. In consequence, as Admiral Dufourcq had argued, it would not be guaranteed in any case that the US would always stand by Europe as a strategic partner. He made this statement especially in regard to the challenges that could evolve through the rising importance of Asian powers, saying that US could turn towards the Pacific area in the same way in which they were orientated towards Europe during the cold war. The US foreign policy, as Admiral Dufourcq put it, is much more influenced by contemporary interests than by traditional or cultural alliances, potentially leaving Europe on its own, therefore needing its own sufficient defense capabilities. After the two Admirals had spoken, the audience was integrated into the dialogue. Olivier Ubeda, former campaign manager of Nicolas Sarkozy and founder and CEO of the political consultancy Ubeda & Partners, raised the question to what extent western values should serve as reference points within a common European Defense and Security Policy. He used the case of emerging powers such as China or India as an example to explain that other parts of the world have different perceptions of values such as democracy, freedom and human rights. These countries may be successful as well without deeming these values to be irrevocable. Ubeda particularly pointed out that China evaluates the conflict between human rights and domestic sovereignty very differently than the West does, showing a clear preference to respect the inviolability of national sovereignty and stability. Accordingly, as Ubeda stated, this also applies to the Western idea of a centrality of democracy and citizen rights, which as well does not apply to China. Following these statements, the passionate debate, which subsequently evolved between the different participants of the discussion, pursued the question whether a normative and value-based approach will rather boost or hinder the development a common European Foreign and Security Policy. Hubertus Hoffmann vehemently argued in favour of values and a soul in foreign affairs, a position that was also supported by Marcel Alexander Räcker, President of the Youth Atlantic Treaty Association Germany. The debate around values and interests led to the final part of a fruitful discussion. Hubertus Hoffmann raised the question what part young 'responsibility-elites' should play within the development process of a common European security strategy. The importance of intellectual elites was a mantra supported by Fritz Kraemer, and Hoffmann argued that it would be important to support smart and dedicated young thinkers to create an intellectual foundation for common European policy-making. The expression elite was received controversially by the audience. Ivana Jablan, who participated in the name of the Robert Schuman Foundation, argued that the concept of an elite always is associated with closeness, and thus per se excludes certain groups or individuals. Dr. Hoffmann clarified his idea of how an elite network should look like and pointed out particularly that elite for him only means intellectual capacity and the will to sacrifice for society. Elite, in his perception, hence includes young academics and professionals mainly from the middle classes, uniting them in the will and capacity to support a liberal, democratic and prospering society. 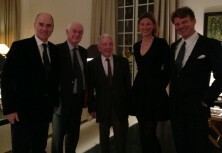 The World Security Network thanked Admirals Pierre Lacoste and Jean Dufourcq for their illustrative and enlightening contributions to the discussion, as well as Nicole Junkermann and Dr. Mario Ohle for their excellent hospitality in this interesting Strategic Salon in Paris. Interview with Dan Lazea: "The total exposure of those who became political police is not possible anymore"